I was born and raised in a beach community here in San Diego. I appreciate the beauty that surrounds me and realize we must conserve what we have for other generations to value as well. I believe in using only the freshest seasonal produce and sustainable fish and meat. These principles are the only way to truly honor the beauty Southern California has to offer. I grew up cooking and baking with my parents. I always knew I wanted to be a chef, but instead of going into restaurants or culinary school after college, I chose the safe path and went into the corporate world. After eight years, I decided I had to follow my heart and moved to San Francisco to attend the California Culinary Academy. It was there I learned to love and appreciate so many new and different cuisines. While in San Francisco I had the opportunity to work in several well renowned restaurants with many highly acclaimed chefs. When I left San Francisco, I came back home to San Diego. In San Diego, I have had the pleasure of working in many different restaurants including Mille Fleurs and Humphreys by the Bay. I had the honor of becoming executive pastry chef and the first woman in the kitchen at Humphreys by the Bay. One of my proudest accomplishments was to go into a kitchen led by men and gain their respect solely on my skills. Now in catering, I work with my clients to meet and exceed their expectations. Using the skills and principles I learned along my path, I always try to go a step further by using only the freshest fish and meats. The best seasonal produce, and locally sourced products and adding the most important ingredient: love. My business is not just my job, it is my passion and I look forward to sharing this with you. We use only the freshest ingredients, locally sourced meats, fish, and seasonal produce. We pride ourselves on our food presentations to not only look good, but our recipes are mouthwatering and amazing. 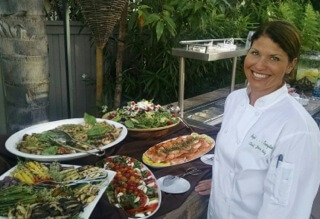 Our recipes are incredibly delicious, and we also create beautiful food displays that compliment your event’s theme. We love to create unique, authentic cuisines for our client’s events. Contact us to discuss. We create the most amazing dishes, desserts, and more for your catered event.